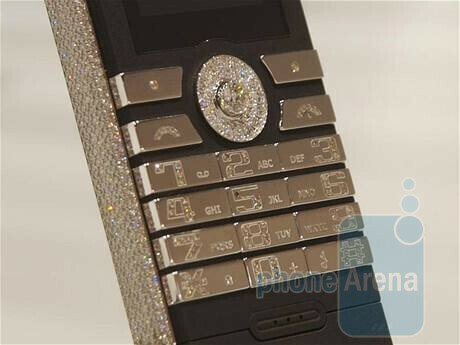 At the Baselworld 2009 were presented some very interesting luxury phones like Ulysse Nardin’s Chairman and the extremely expensive Revolution by the Swiss company GoldVish. 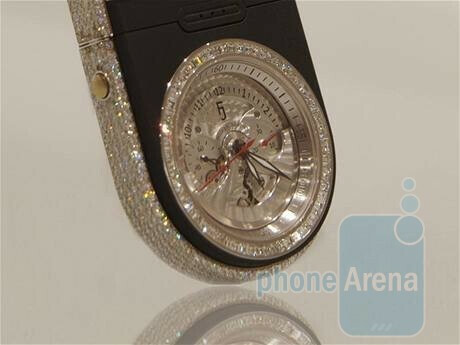 It is known for the Le Million, a handset with the hefty price of $1,200,000. The Revolution is not that expensive (only $490,500) and has analog watch with visible moving parts, made by Frederic Jouvenot. The body of the Revolution is covered with 18-carat pink and white gold, and is encrusted with diamonds with a total weight of 29 carats. The manufacturer claims that it uses “the latest mobile technology”, but currently there is no information about its specifications. Currently there is no information about the availability but don’t expect to see it in the local IKEA store. WHO NEEDS PUNCHED IN THE THROAT!!! !WHO EVER BUYS THIS PHONE DOES. 1. its ugly 2. cell phone already hve a clock on them. 3. candy bar style c'mon so 90's. all i got to say is a punch in the throat. thats definitly one of the ugliest phones i have ever seen. Certainly is a device a very select few could own. I'd take one just to be one of those few. Piss on my $150 Storm, with my $500k phone! LOL! Who cares what it looks like, it's exclusive as ----! It's one of those things that if you had the money, Who cares what it looks like. Most of the people that have this kind of money to blow like that are looking for status. I know I would if I had an everlasting cash with no signs of it diminishing. I'd rock the $hit out of that phone. lol. But I would probably have a real normal $100 phone in another pocket as well.